Do you have WiFi enabled laptop? You want to transfer the files among your friends WiFi laptops? Below is the process of file sharing or file transferring. Even you can share your Internet Connection. Here there is no need of any extra softwares. Just using the resources already we have...! Actually why I created this post is- I know Adhoc network but not known the settings about file transferring in WiFi. Even I searched in Google, but not found Step wise. After working on Network settings I finally got it. After I got the process I want to share this to you. So it can be helpful to Newbies. This process is applicable for windows. Here I use Windows 7/Vista. If you feel the following images are not Visible, click on them to see in large. 1. Enable WiFi and Open Control Panel --> Network and Internet --> Network and Sharing center. 2. Click on "Setup a new connection or network". 3. In choose a connection option select "Setup a wireless adhoc network", last option in the list. Click Next. Check on "Save this network" and click Next. 5. ( For Dialup Connections) If you already have internet, it will asks you Share Internet, if you like to share internet also, Click Yes. 6. Now you got a window, stating Your network is ready to use. Click close. 7.Now you have connect to your own network on your PC, by Control Panel --> Network and Internet --> Network and Sharing center --> Connect to a Network. 8. Now a list of connections available will be shown, click on the Network you created and click connect. Upto now, you have created an Adhoc Network and by Step 8, you are broadcasting your WiFi signal. Let this computer is COMPUTER 1. 9. Enable WiFi, Open Control Panel --> Network and Internet --> Network and Sharing center --> Connect to a Network. 10. In the list, you will see the Network Name you created on Computer 1, Click on it and Connect. 11. It will asks you the Security Key , Enter it. Which you created in Step 4(c) and Click OK.
12. If you entered the Key correctly, the both will process for a few moments. 14. Now both are connected and on same Network via WiFi. 15. On Computer1, open Control Panel --> Network and Internet --> Network and Sharing center. In the left side pane, you will see the "Change advanced Sharing settings " Open it. 16. Select Home or Work, Under it, Turn On all the options which are OFF. 17. On Computer2, Open ControlPanel --> Network and internet --> Home Group Click on What is a network Location. Then in that select Home Network. 18. Here in Computer2, it will asks your Computer1 Home group password. You can find it on Computer1's ControlPanel --> Network and internet --> Home Group --> View or print home group password. See it and Enter the password on Computer 2. 19. Now both are ready for File Sharing. 20. If all is configured well, Open My Computer, in the left side panel below you can see NETWORK. Click on that. 21. Now you can see the other computer name, click on it and you will see the folders that are available to share. 22. If you want to share any specific file/folder, just left click on the file/folder you will see "Share with" options, Select Home Group (Read/Write). Open Control Panel--> Netwirk & Internet--> Network & Sharing Center --> Click On Change Adapter Settings. Now Select your Connection (Your Internet Connection) right-click & select Properties--> Sharing Tab--> Make a Check mark on "Allow other Network Users to Connect through this Computer Internet Connection "
Hope, you liked this one... If you are strucked in the process make it in Comment box. I will solve it for you! 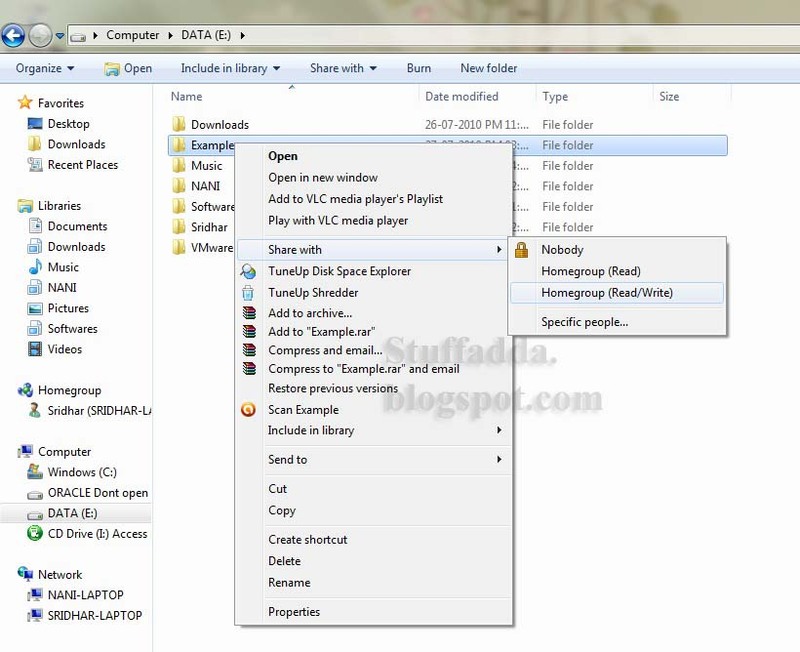 Tags: How to share file/folder between two computers, how to transfer files in WiFi, transferring files in network, sharing files in network. 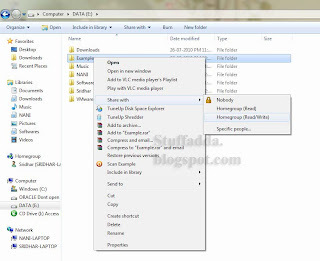 WiFi network, How to create an adhoc network, Filesharing settings. 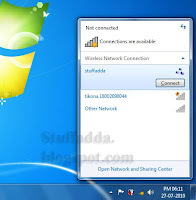 in Windows Vista or 7, How to share Internet connection using WiFi.with screenshots.